The definition of a manager is a person who handles, controls, or directs. Household managers handle, control, and direct the everyday tasks and functions of their home. Because the role of home manager touches basically every aspect of your life and those of your family, it can have a great impact, either positive or negative, on everyone in your family. Now, don't get me wrong, you are not ultimately responsible for everyone in your family's happiness, or lack thereof, because there is something called free will and personal responsibility. But, there is some truth in the phrase, "if Momma ain't happy, nobody's happy." Therefore, developing and improving your skills as a home manager can bring positive results -- enjoying your home and family more, and the opportunity for everyone else in your family to do the same. So, what does a home manager do? Actually, it is easier to start by saying what she doesn't do -- she is not a maid, nor does she do everything all by herself. That is the challenge -- involving everyone in the family in the day-to-day activities of life, by handling, controlling, and directing. So, how does she do all these things? She "handles" things by doing them herself, such as when her children are too young to help with the task, she has delegated the task to herself, or because she is setting an example for her family by pitching in to get the job done. She "controls" by having a master plan of what needs to be done, and how to do it. 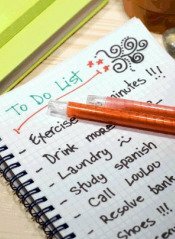 This involves the usual daily to do lists, but also the bigger picture tasks like family goals, and the more routine details such as weekly cleaning schedules. This also involves creating and maintaining a household management notebook to keep the big picture and details organized and available for any family member that needs to see them. Finally, she "directs" by delegating certain responsibilities, such as chores to other members of the family. But she does not just dump responsibility on someone without any training for chores, so delegating actually, at least at first, takes a lot more effort than just doing it herself. Learning to become a good household manager does not happen overnight, and actually is a never-ending process, because there are always new things to learn, new obstacles to overcome, and ever changing circumstances in life. The time and effort involved in learning these skills is well worth it though, because it has the potential to have such a positive impact on both you and your entire family. Are you ready to get started?